Compatible System - Requires no driver installation. Support Windows 10 / 8.1 / 8 / 7 / Vista / XP, Mac OS X 10.6 to 10.9, Linux 2.6.14 or above. 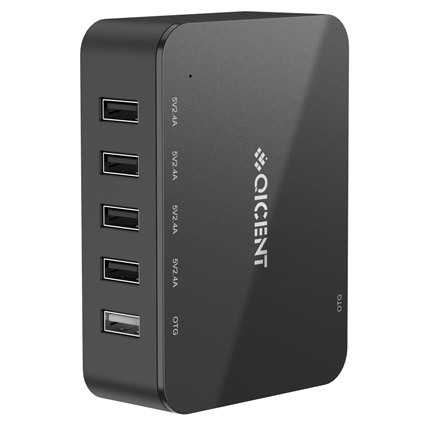 More Stable 7 Port USB Hub - 12V 2.5A 30W big power supply for hub, make data transmission more stable , ensure that it will not data break due to the power supply shortage. Individual LED indicators - 7 blue LED indicators for USB ports to show whether every port are in good data transfer state. High-quality materials - High strength fire & H.E.A.T resistant ABS plastic. Rubber oil process, Feel very soft and comfortable. 18 months maintain, whether it’s your first QICENT purchase or you’re back for more, rest assured that 18-months maintain ensures long-lasting enjoyment of your purchase. Any questions, please feel free to message us, we are always here for you.